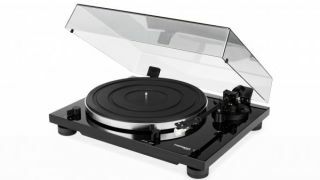 Thorens unveils two budget plug-and-play turntables | What Hi-Fi? Hoping to make more of a mark on the ever-determined vinyl revival, legendary turntable brand Thorens has revealed two new turntables, the TD 201 and TD 202 - which sit below the TD 203 we awarded four stars to last year. Aimed at vinyl newcomers, both belt-driven decks have plug-and-play designs with preconfigured cartridges, as well as integrated switchable phono stages for direct connection to any amplifier, receiver or external phono stage. The TD 201 and TD 202 use Thorens' new TP 71 tonearm, but while the TD 201 has an AT 3600 cartridge attached to its detachable headshell, the TD 202 uses an AT 95E cartridge. Its plinth is slightly larger, too, and it also falls under the USB turntable umbrella, featuring a USB output (and an analogue-to-digital converter) for recording vinyl albums as digital files to a computer. Both the Thorens TD 201 (€449) and TD 202 (€599) will be available in high-gloss black from the end of November 2018.